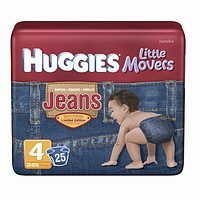 Hurry over to Drugstore.com and snag these cute Huggies Little Jeans Movers Diapers for only $1.99 a package! It looks like this awesome price is only available on the size 4 diapers. There is a limit of 1 pack per person, and shipping is free on orders over $25, or if you sign up for a free ShopRunner trial. Limit 1. :( After the $6 shipping, it works out to 31 cents/diaper, which is very high for size 4 in general.